Welcome to Anthony’s shade sails! If you’re looking for a one-stop shade solution on the Gold Coast, you’ve come to the right place. From your first call or enquiry with us, our expert team will put you at ease and help make the process as easy as possible. We take care of everything in-house, including design, manufacture, and installation. Our experienced team are fully trained and use modern equipment to manufacture shade sails and structures suitable for both commercial and domestic applications. Our manufacturing is done right here at our own site on the Gold Coast. Our fully equipped factory is made up of a steel fabrication workshop complete with heat welding tools and a shade sail loft complete with industrial sewing machines. Our factory also has a special hydro-bath for cleaning sails and 2 PVC frequency welders. The number one reason is the experience! Shade sails need to look good and they need to be purpose built to fit your design aesthetics and be strong enough to withstand all weather events. On all 3 accounts, we tick the box! 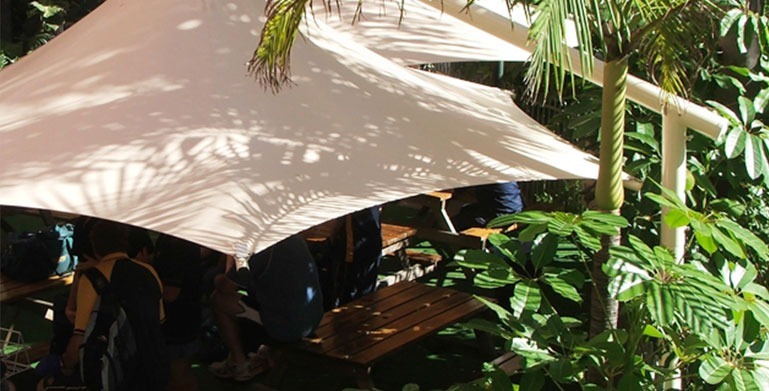 We have been designing, manufacturing, and building shade sails on the Gold Coast since 1996. That’s a lot of experience! Our business is family owned and all team members receive supervised on the job in-house training. We also stay up-to-date with industry trends and developments in manufacturing techniques. We understand that shade sails are not just about the practical elements. Your shade sail should blend into its environment and add value to your property. We work with you to create a unique design in a colour and size that you love. When you work with Anthony’s Shade Sails, you get all our experience and passion for creating beautiful and functional shade sails. A shade sail should last a lifetime and only require re-tensioning and/or an inspection occasionally. We take pride in delivering outstanding workmanship and attention to detail to ensure the results will delight you. If you’d like a no obligation free measure and quote for any application involving shade sails call us during our business hours Monday to Friday 8:00am until 5:00pm or on Saturday from 8:00am until midday.